Everyone had moments of being fed up with their jobs at some point in their lives. Sure, quitting your job frees you up for a lot of other possibilities but is it really the solution? Are you ready to search for another job or follow your passion to start your own business? Maybe you want to quit your job to travel the world but are you ready for it financially? 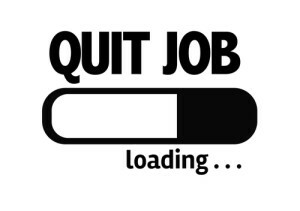 Quitting your job is a big decision and there are lots of different aspects of it to consider. You should carefully evaluate all pros and cons. Therefore, ask yourself the below questions to make sure you are really ready to quit your current job for something else. What do I want for my career? What is my ultimate goal? What makes me happy? What is my real passion? Do I have a plan for a new job search? In what field am I going to search my new job? How long will it take me to find another job? If I want to start my own business, do I have a realistic plan to start it? Is the timing right? How much do I need to invest? How long will it take me to start earning money? Am I financially secure? Do I have enough money to cover my expenses for a year? What about health insurance or other kind of benefits like retirement? Am I willing to let them go for a while? If yes, for how long? How long have I been working in my current position? Have I gained enough experience from this job? What about my previous positions? How long have I worked in my previous jobs? Was it enough? How is my current commute to work? Is my work no longer challenging or are my tasks repetitive? Have I done everything I can to make it more interesting? Do I have a career path in this company? Is this job professionally developing? Is this decision made because of emotions? Am I having difficulty to work with my boss/coworkers?